James Harden hit new heights last night in Houston’s win over the Timberwolves. 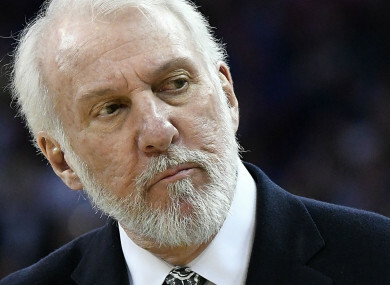 SAN ANTONIO SPURS head coach Gregg Popovich will miss tonight’s Game 5 clash against the Golden State Warriors as the veteran continues to mourn the death of his wife. The Spurs announced Popovich’s absence on Monday, with assistant Ettore Messina to once again lead San Antonio as he did in Games 3 and 4 of the Western Conference first-round series. Popovich’s wife, Erin, died on April 18 after a lengthy illness. She was 67. Messina guided the Spurs to a 103-90 victory in game four to stave off elimination, but trailing 3-1, San Antonio face a must-win situation in Tuesday’s game at Golden State. Messina, 58, is a former EuroLeague and Italian national team head coach who joined the Spurs’ staff in 2014. James Harden scored 36 points as the Houston Rockets moved to the brink of a Western Conference first round playoff series victory with a 119-100 rout of the Minnesota Timberwolves on Monday. Harden underscored his status as front-runner for the NBA’s Most Valuable Player award after leading a stunning third quarter performance that saw the Rockets explode for an astonishing 50 points. That devastating burst of scoring – a franchise record – included 22 points from Harden as the Rockets transformed what had been a one-point contest at half-time into a comfortable victory. “We hit the switch that we’ve been trying to hit since the beginning of the playoffs, at both ends of the court,” a satisfied Harden said afterwards. The win gave Houston a 3-1 lead in the best-of-seven series, giving the Western Conference leaders a chance to book their place in the second round of the playoffs with a victory at home in game five on Wednesday. The smart money will be on Houston to wrap up the series quickly after Monday’s demolition job at Minnesota’s Target Center arena. While Harden’s virtuoso third quarter performance ultimately decided the contest, the Rockets will also take heart from an offensive display that saw five players finish with double-digit points tallies. Point guard Chris Paul weighed in with 25 points — including 15 in the lop-sided third quarter — while Eric Gordon had 18 and Trevor Ariza 15. Center Clint Capela finished with 14 points, and also pulled down 17 rebounds during his 31 minutes on court. The Timberwolves’ scoring was led by Karl-Anthony Towns with 22 points, while Jimmy Butler (19) and Derrick Rose (17) also made significant contributions. Minnesota had looked capable of snaring a series-leveling victory after a close first half, in which the Rockets took a 50-49 lead at the break. But Houston’s scorching 50-point third quarter saw the Rockets head into the fourth quarter with a 100-69 lead. While Minnesota closed the gap as Houston eased up, the Rockets never looked like surrendering the initiative, keeping the Timberwolves at arm’s length as they closed out the win. In Monday’s other game, the Utah Jazz moved to within one win of clinching their series against the Oklahoma City Thunder with a convincing 113-96 win in Salt Lake City. Rookie star Donovan Mitchell made the decisive contribution for Utah with 33 points as Russell Westbrook and Paul George’s Thunder came unstuck. Utah now lead 3-1 heading into game five in Oklahoma City on Wednesday. All five Utah starters made double figures as the Jazz overturned a 30-24 first quarter deficit to tilt the contest in their favour in the second and third periods, outscoring the Thunder 66-43. George led the scoring for Oklahoma City with 32 points while Westbrook had 23 points and 14 rebounds. Carmelo Anthony finished with 11 points on a night when the Thunder’s offence was effectively contained. Utah’s Spanish international Ricky Rubio saluted the performance of Mitchell, who belied his age with a composed performance. The 27-year-old Rubio, who finished with 13 points, also said the collective defence had helped subdue the potent Oklahoma City line-up. Email “Spurs coach Popovich will miss Game 5 against Warriors, as Rockets and Jazz win again”. Feedback on “Spurs coach Popovich will miss Game 5 against Warriors, as Rockets and Jazz win again”.